AutumnCare is a clinical management system that eliminates double entry of data. Never again re-enter the same information twice into two separate forms. Gone are the days of filling out an assessment only to then re-enter the same information into the care plan. 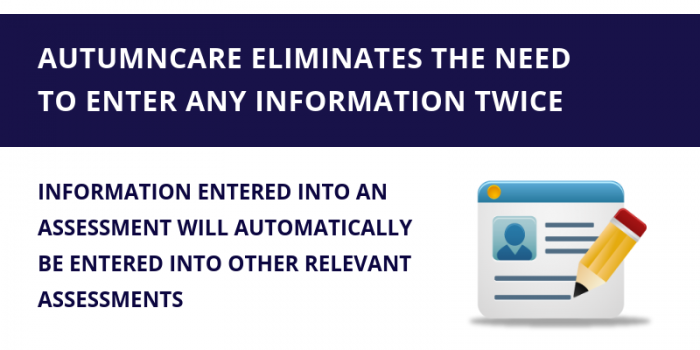 AutumnCare eliminates the need to enter any information twice. Information entered into an assessment carries over to the associated care plan. This also applies to any information entered across the entire clinical system. Resident admission details such as demographical data will automatically prefill into all other forms. 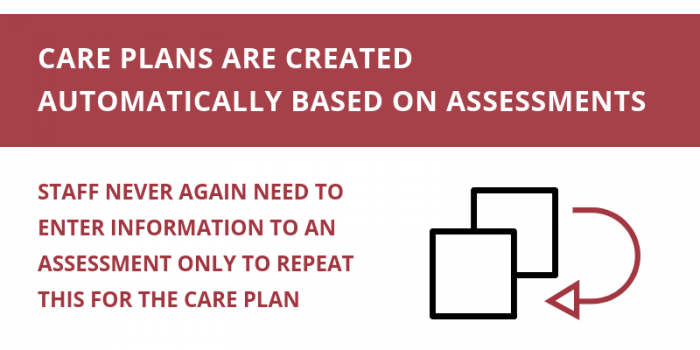 AutumnCare links assessments to care plans and links relevant assessments to one another. Staff are able to complete assessments faster. Answers from one assessment will automatically be carried across to linked assessments. Staff never need to worry about using an outdated care plan. When an assessment is updated, the associated care plan is also automatically updated. The staff member completing the assessment will be prompted to view the changes that have been made. AutumnCare enhances efficiency by ensuring when assessments are updated, care plans are automatically updated to reflect the changes. The time-consuming need to enter information twice is eliminated across all forms and assessments. This also promotes safety by ensuring that care staff are providing care according to current resident needs. Make the switch to a smarter system that saves you time.